You have so much to rejoice in today, so much to be glad for, so much to give praise for, and so much for your faith to celebrate. 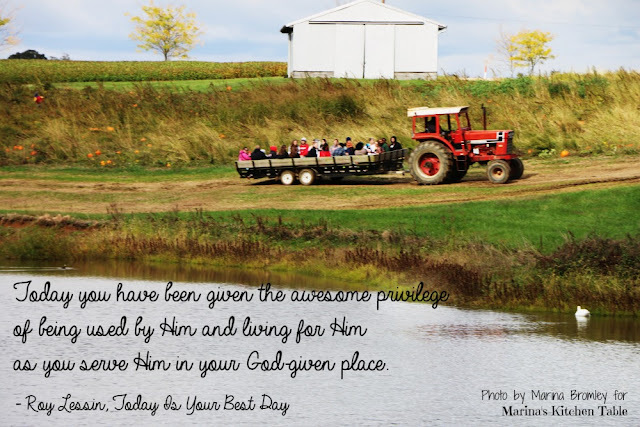 Today you have the awesome opportunity to serve the Lord. Think of it: The God who is majestic, all-powerful, altogether lovely, and altogether worthy wants to use you to reach out and touch others for His glory. From His high and holy place He works through the lowly place of your heart to touch the hearts of those who are in need of a revelation of His love. Isaiah 57:15 (NLT) declares, "The high and lofty one who inhabits eternity, the Holy One, says this: 'I live in that high and holy place with those whose spirits are contrite and humble. I refresh the humble and give new courage to those with repentant hearts.'" As God's servant you are in His hands as He conforms and transforms you into His image. In His hands, your life is the voice that speaks His words to those who need to know the truth; the hand that extends His love and mercies to those who are hurting; the example that demonstrates His kingdom to those who need to know the way. Today you have been give the awesome privilege of being used by Him and living for Him as you serve Him in your God-given place. Today you are the bond servant of the righteous Master, the ambassador of the great King, and the messenger of the eternal Word. As His servant, you live for His approval, look for His smile, and labor for His glory. Your eyes are fixed upon His face, your heart is fixed upon His will, your ears are fixed upon His voice, and your life is fixed upon His pleasure. Your deepest motivation is not duty or obligation, but love. All that you do, you do for love's sake. Your "Yes" to His will is an obedience of love, your work is a labor of love, your praise is an offering of love, your giving is an extension of love, and your worship is an expression of love that comes from the deepest part of who you are.